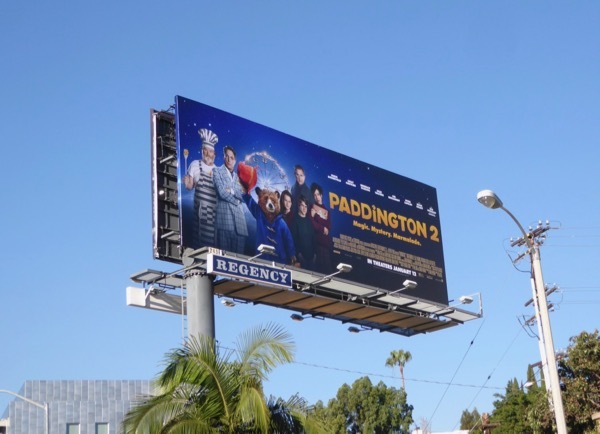 Michael Bond may have sadly passed away last year, but his beloved creation, 'Paddington Bear', continues to live on on the big screen in 2018. 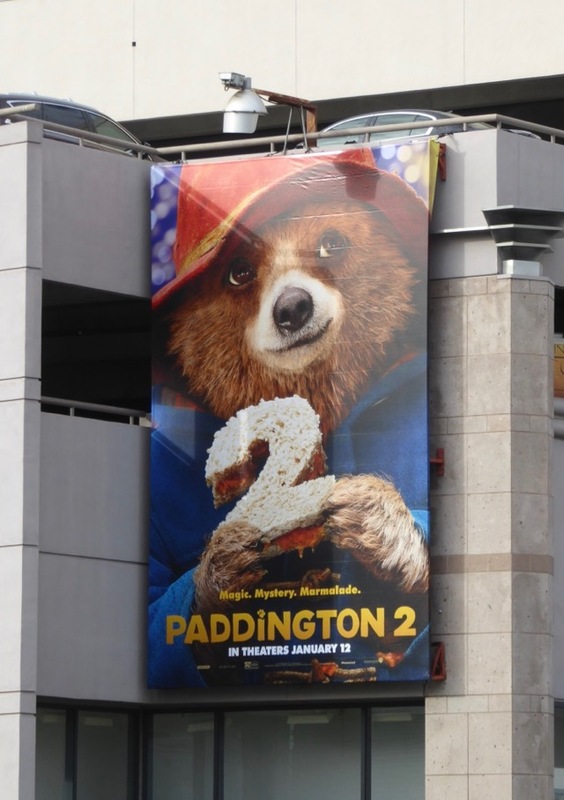 Paddington 2 sees the marmalade-loving bear from Peru (voiced by Ben Whishaw) back for more family-friendly adventures with the 'Brown' family (headed by Sally Hawkins and Hugh Bonneville). 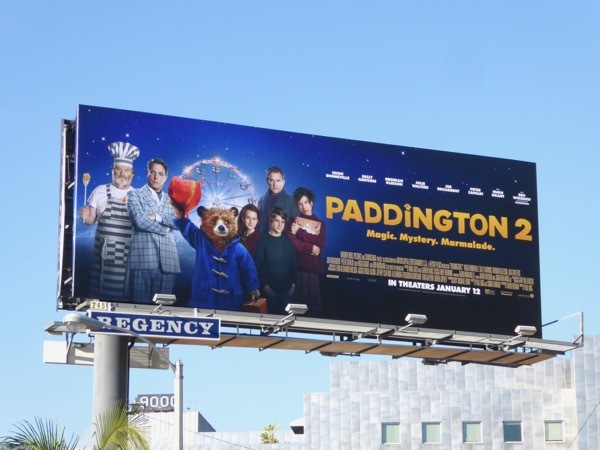 In this cinematic installment Paddington enters the workplace, doing a variety of odd jobs to earn enough money to buy the perfect gift for his Aunt Lucy's 100th birthday, an antique pop-up book of London, only to have it stolen and then find himself framed for the crime. He'll need new friends like Jim Boadbent to help him find the thief, clear his name and stop his new dastardly nemesis, played by Hugh Grant. 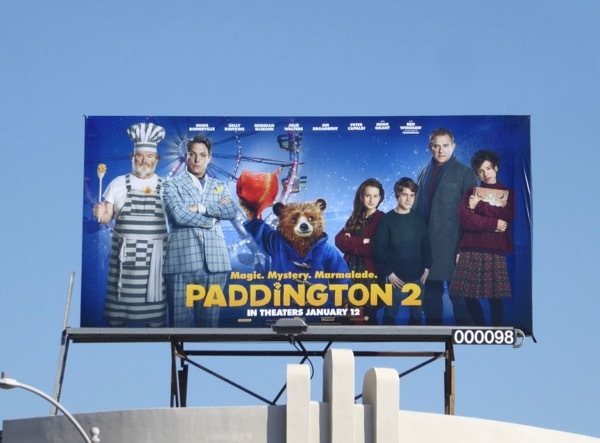 These movie sequel billboards were snapped along West Hollywood's Sunset Strip, La Cienega Boulevard and Beverly Boulevard from December 6, 2017 to January 5, 2018. 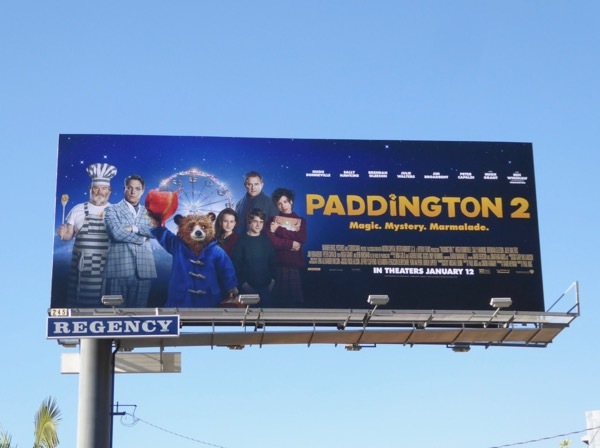 Plus fans of the lovable bear can also enjoy these Paddington movie billboards from 2015. Grab your popcorn, and marmalade sandwiches, and take your seats for some family fun. And remember, if you're kind and polite the world will be right.